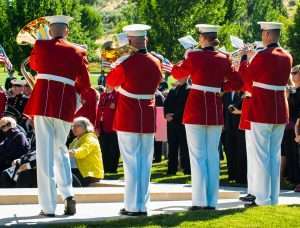 Idaho recently honored Medal of Honor recipient Arthur J. Jackson in a memorial ceremony held at the Idaho State Veterans Cemetery in Boise. Art passed away on June 14, 2017. 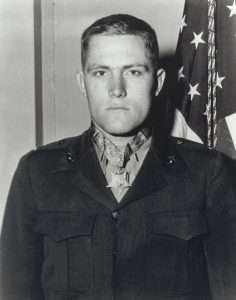 Art’s Medal of Honor was for his actions as a Marine PFC with the Seventh Marine Regiment on the island of Peleliu in 1944. You can read the citation here. A young Art Jackson with his Medal of Honor. The United States Marine Corps was involved in Art’s memorial and they brought Marines from Washington’s 8th and I Barracks as well as Marine Corps Band members who serve in the President’s own band. The weather was warm, but not hot, and a breeze out of the west set the flags to fluttering. Art and Sally Jackson at a celebration of Art in 2016 in Boise Idaho. Photo courtesy of Betty Rodgers. 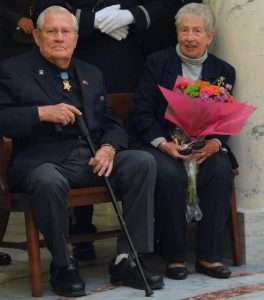 A good sized crowd arrived in time to see Art honored with a 21 gun salute, a flyover by Marine Corps F-18s, a service delivered by the Boise Rescue Mission’s Reverend Bill Roscoe, and a solemn presentation of the American flag to Art’s wife, Sally. I got acquainted with Art last year while we interviewed Sally Jackson for our upcoming film I MARRIED THE WAR about the wives of combat veterans. I was lucky enough, while Sally was being interviewed about her art work or going through old photos of family and friends, to chat with Art at some length. 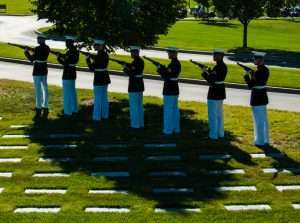 Marines from 8th & I honoring Art with a 21 Gun Salute. Photo courtesy of Ken Rodgers. At the time, Art was ninety-one, so his memory was a little worn and I doubt he remembered me the few times we met, but he did tell me some things about his service in the Marine Corps. He talked about the miserable weather at Cape Gloucester and the horrible ordeal of Peleliu and the brutal and grueling grind of Okinawa. When Art told me these stories he’d stop midsentence and stare off at the other side of the living room, and I knew he was back there, reliving those moments, whatever they might be at that instant. I don’t know, he may have been thinking about what he was telling me, or it could be something else: the face of a Marine who stood beside him in one of the firefights, or it could have been a recollection of the dead volcanic terrain of Peleliu, or the shattered families, the frightened children and other locals on Okinawa. The rest of Art’s biography is interesting and you can read about it here. On Peleliu, Art’s actions came to be referred to as “the one-man assault.” He was responsible for killing fifty Japanese soldiers—solo, no help. Members of the President’s Own Marine Corps Band performing at Art’s memorial. Photo courtesy of Ken Rodgers. When I think about what that means, killing all those men, leads me to think about my own combat experiences. For the most part, my time at Khe Sanh was spent dodging incoming—everything from 152 MM artillery rounds roaring in from Laos to 7.62 rounds from SVD sniper rifles. But in one instance I was involved in an assault into an entrenched position of an NVA battalion. On that day, after an hours-long often hand-to-hand struggle, the men of my outfit, Bravo Company, decimated that battalion of NVA. Some of my comrades were honored with Navy Crosses and Silver Stars and Bronze Stars, but as far as I can recall no one did anything to match what Art Jackson did on Peleliu. People talk a lot about courage when they talk about Art Jackson. What is the nature of courage? I don’t hold with the notion that what Art did or what others do in times of intense pressure is done without fear. I suspect courage comes forth in spite of fear. 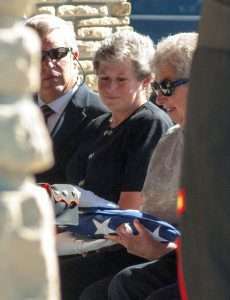 Sally receiving the American Flag from Art’s coffin. Photo courtesy of Ken Rodgers. Most of what I did in my stint during the war—and I was under fire a lot—was to do what was required of me and sometimes that placed me in extreme danger. And although I was scared, whether I did anything or not made no difference. I was still scared. And also, after all the forty-nine-plus years since I left the war, I’ve come to believe that a lot of what I did that led me to eschew my own safety on the battlefield was due to peer pressure. I thought then and I believe now that next to death and maiming, and maybe, in some instances even before those horrible results of combat, behaving so that I was not thought of as a coward by the men with whom I served was the prime motivator for my taking actions that were life endangering. Fear is a powerful motivator and left unchecked it can eat a man or woman up, drive them to inaction in a situation demanding action, can force them to hide when those they love die. To overcome that requires courage. Lastly, besides peer pressure and duty, a man or woman engaged in combat will go above and beyond to help their comrades. Some people call it love. I don’t know what to call it other than regard for those with whom you share a bunker, those who make you laugh, who walk through the valley of death with you, who will pull you to safety when you get shot. As a Marine, we all felt we owed it to our brothers to help them if they were in extreme danger. A creed, I guess, that seems to be overdone these days, but more than a creed, something, on second thought, that is akin to love. And somewhere in there, I’m sure courage is involved. I don’t know what Art Jackson’s reasons were for doing what he did. Maybe it was all of the above. I am glad I got acquainted with Art Jackson. He was a national hero. The citation for Art’s Medal of Honor states that he was “stouthearted and indomitable.” I think that’s something all of us would, in some fashion, like to be. Rest in peace, Art, and Semper Fi.